The world demands justice. People protest and riot for justice. Little do they realize, if God gave us justice, we would all go to Hell, because we have all sinned. Fortunately, God loves us so much that He has offered mercy to us instead of justice, through faith in His Son Jesus Christ. 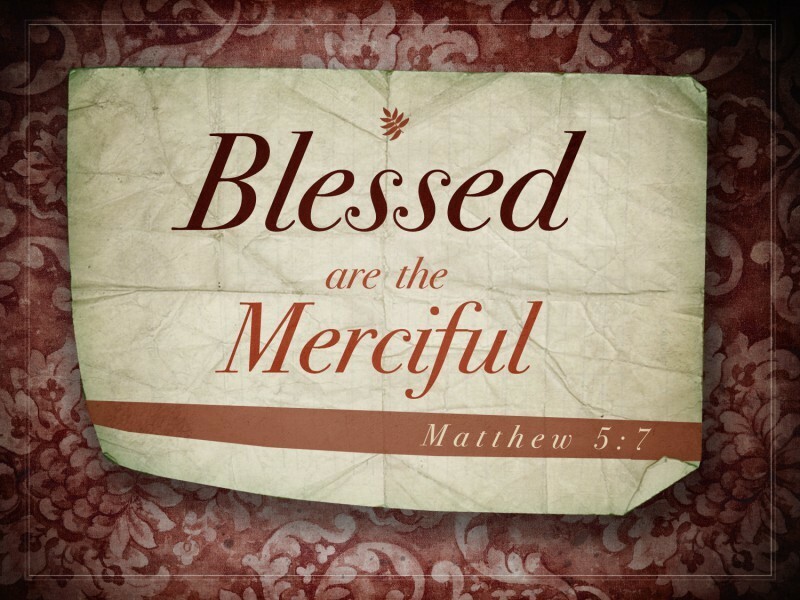 In the first four beatitudes, Jesus teaches us how to receive mercy from God. We become poor in spirit, mourn over our sin, become meek and useful to God, and hunger and thirst for righteousness. Then we are blessed with the Kingdom of Heaven, comforted by the Holy Spirit, inherit the earth, and given the righteousness of Christ. Next, Jesus presents the beatitudes which tell us how to relate to one another and be blessed. 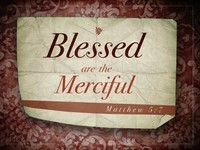 We begin with Matthew 5:7 Blessed are the merciful, for they will be shown mercy. kindness only when you think something’s in it for you. 5. Mercy isn’t merely a feeling of pity or sorrow for others. So, WHAT IS TRUE MERCY? First of all, “Mercy is Compassion that goes into Action.” It is doing something with the feelings we have for someone. Those feelings could be sympathy or antipathy. Mercy goes beyond our feelings to empathy. In other words, mercy is "love in action." James 2:15-16 Suppose a brother or a sister is without clothes and daily food. If one of you says to them, “Go in peace; keep warm and well fed,” but does nothing about their physical needs, what good is it? Mercy is an action, not a reaction. Since mercy is love in action, the merciful are forgiving. But even forgiveness can be too weak a description, unless we understand that we are not only to forgive the injury done to us by another, but we are also to help the one who hurt us to recovery. And that’s the hard part isn’t it? It’s one thing to say we forgive, it’s another to become actively involved in mercy. Mercy’s clearest example is Jesus Christ. Our Lord didn’t just sit up in Heaven and passively say, "Okay, whoever, believes in Me, I’ll forgive them." John 3:16 does NOT say, "For God so loved the world that whoever believes in His Son will have everlasting life." It says, "For God so loved the world that He “what"? He gave His one and only Son." 1 John 4:9-10 explains what God did further- This is how God showed his love among us: He sent his one and only Son into the world that we might live through Him. This is love: not that we loved God, but that He loved us and sent his Son as an atoning sacrifice for our sins. Due to our sin, we all have a death sentence and punishment in Hell. By action, Jesus demonstrated mercy. He died for us, atoning for our sins, with His blood so we might live through Him. That is more than forgiveness; that is love in action; that is mercy! How do I apply this Beatitude in my everyday life? How do I practically demonstrate this love action word, this mercy? Well, there are many, but here are four ways to evaluate yourself and you can ask God to make you more merciful in these areas. (1) How do you treat those who are different? Those who seem a little odd to you? Those who come from a different culture or upbringing? Merciful people are accepting people. They see everyone as an equal, a person whom God loves and Jesus died for. Merciful people realize God’s goal is to take all the different people He made and make them like-minded in Jesus Christ to glorify Himself. We become God’s bouquet, the Bride of Christ, the Church. It’s an interesting thing about forgiveness; that when we are called to receive it, it is so easy and feels so right. But when we are called to give it, it is so hard and feels so wrong. When we are sinned against, it’s not natural for us to show mercy, we want justice. However, a merciful person is one who can forgive the sinner. And that doesn’t just apply to those who have sinned against you, but also to those who have sinned in ways that you just cannot understand. All of us have vulnerable areas to temptation. And maybe you can’t understand how someone can have a lust problem, but they don’t get why you struggle with gossip. Maybe you cannot conceive how anyone could ever take drugs, but they can’t fathom your inability to deal with gluttony. How do you treat those who have sinned? Merciful people don’t point a finger, they lend a helping hand, which brings us to the next area. (3) If I’m a merciful person, I’ll help those who are hurting. When someone is suffering, a merciful person doesn’t mind getting involved! The Samaritan, in Jesus’ parable, is a good example. While the religious people avoided the injured man, the Samaritan got involved, dressed his wounds, took him to an inn, and paid all the expenses. However, Jesus says this: Luke 6:32-36 If you love those who love you, what credit is that to you? Even 'sinners' love those who love them. And if you do good to those who are good to you, what credit is that to you? Even 'sinners' do that. And if you lend to those from whom you expect repayment, what credit is that to you? Even 'sinners' lend to 'sinners,' expecting to be repaid in full. But love your enemies, do good to them, and lend to them without expecting to get anything back. Then your reward will be great, and you will be sons of the Most High, because he is kind to the ungrateful and wicked. Be merciful, just as your Father is merciful. Now, that is exactly the opposite of what the world says. The world says, "When people hurt you, hurt them back." God says, not only are we to forgive our enemies, we are to do good to them. After all, we have been God’s enemy and He is merciful to us. He does good to us even while we rebel against Him. “Be like Me,” God says. Now, I know this is easy to talk about but hard to do. Paul echoes Jesus’ words in Rom 12:17-21 Do not repay anyone evil for evil. Be careful to do what is right in the eyes of everybody. If it is possible, as far as it depends on you, live at peace with everyone. Do not take revenge, my friends, but leave room for God's wrath, for it is written: "It is mine to avenge; I will repay," says the Lord. On the contrary: "If your enemy is hungry, feed him; if he is thirsty, give him something to drink. In doing this, you will heap burning coals on his head." Do not be overcome by evil, but overcome evil with good. Do you know the best way to defeat an enemy? Make him your friend. You can do that by doing good to them, in spite of what they do to you. That’s mercy, but how can we do this hard, unnatural thing? We can’t, but the Holy Spirit in us gives us the grace and power to show mercy, if we will yield our feelings to Him and follow His guidance. The Holy Spirit also reminds us that God is much more merciful to us, and therefore, it is right for us to show mercy to others. That’s the whole point of the parable of the unmerciful servant. Let’s read it. Matt 18:23-35 "Therefore, the kingdom of heaven is like a king who wanted to settle accounts with his servants. As he began the settlement, a man who owed him ten thousand talents was brought to him. Since he was not able to pay, the master ordered that he and his wife and his children and all that he had be sold to repay the debt. "The servant fell on his knees before him. 'Be patient with me,' he begged, 'and I will pay back everything.' The servant's master took pity on him, canceled the debt and let him go. "But when that servant went out, he found one of his fellow servants who owed him a hundred denarii. He grabbed him and began to choke him. 'Pay back what you owe me!' he demanded. "His fellow servant fell to his knees and begged him, 'Be patient with me, and I will pay you back.' "But he refused. Instead, he went off and had the man thrown into prison until he could pay the debt. When the other servants saw what had happened, they were greatly distressed and went and told their master everything that had happened. Then the master called the servant in. 'You wicked servant,' he said, 'I canceled all that debt of yours because you begged me to. Shouldn't you have had mercy on your fellow servant just as I had on you?' In anger his master turned him over to the jailers to be tortured, until he should pay back all he owed. "This is how my heavenly Father will treat each of you unless you forgive your brother from your heart." When I think of all the forgiveness that God has given Jerry Trauger; of all the times I’ve done things my own way; of all the ways I’ve sinned; I am amazed that God loves me. If He can be merciful to me, with all I’ve done, shouldn’t I be merciful to others? We should remember what Jesus has done for us and thank God for His mercy and pray “Father, make me merciful like you!” After all, I’m going to need more of His mercy in the future. In other words, "you get what you give" or “you reap what you sow”. Mercy is not getting what we deserve, but what we need. And we ought to be motivated to give it because we will need it. And that, says Jesus, is the blessing of this beatitude. Blessed are the merciful, for they will be shown mercy. Jesus said it works the other way too. If you’re not merciful, you won’t receive mercy. I don’t know about you, but that, to me, is a sobering thought. Being merciful is obviously mighty important to God. And it should be mighty important to us, too. Jesus has stated it very simply so we can understand the truth: when we’re merciful, we enjoy God’s mercy. When we are not merciful, we are inviting God’s justice upon ourselves. Let me ask you. What do you do when you’re hurt? Do you put the fire out, or do you heat it up? Do you get over it, or try to get even? Do you let your hurts heal, or do you let your hurt turn bitter and into hate. That’s probably a good definition for resentment: hurt turned to hate. "Resentment is when you allow what is eating you to eat you up." Resentment is the deliberate decision to nurse the offense until it becomes a grudge. Jesus declares that those who are merciful “will be shown mercy.” This is the only Beatitude where the promise is the same as the condition. The more we understand how much mercy we’ve received, the more mercy we’ll give to others. And the more mercy we show, the more mercy we get. Instead of judging others, we can offer people something they don’t deserve: unqualified mercy. We give them what we have been given, and in so doing, we receive more mercy. Please understand, I am not saying mercy can be earned. It is God’s gift through faith in Jesus Christ. We are given mercy before we show any mercy towards anyone else. How thrilling it is to go through life sharing Jesus, God’s mercy, and not having to judge people to see if they are ‘worthy’ of what we have been given. We stop looking at externals and begin to see people through the merciful eyes of Christ. We are forgiven; therefore, we can extend forgiveness to others. When we leave this building, sooner or later we will face “that person” again. You know, “that person” who is constantly criticizing us. “That person” who acts like a jerk. Jesus says we are to show “that person” mercy. We are to show mercy even to people who are jerks. How would it be that if each time “that person” criticized you, you complimented him? Why should we take this risk of showing mercy and subject ourselves to their abuse? Because it is what God wants us to do. Smother them with the kindness and mercy that God has shown you. They won’t know how to respond to it, because they don’t expect it. They may reject your kindness because they have a wall built up to protect themselves. However, now you’re in control of the situation. You’re on the offensive not the defensive. There is a hurting person behind that wall that needs the love of God. Remember mercy is love in action. God wants us to be like Him. God has shown us mercy so that we can show mercy. That way others can see God in us and be drawn to Jesus Christ to receive mercy instead of justice. God has given us so much, and we are to give out what we have received from God. God has given us love. We should love others. God has given us kindness. We should be kind to others. God has given us forgiveness. We should forgive others. God has given us mercy. We should show mercy to others. How do I become a merciful person? The starting point is that you must first experience the mercy and forgiveness of God. You cannot offer unconditional mercy to anyone until you have first received unconditional mercy. You can’t be a forgiving person unless you have been forgiven. The starting point is receiving the mercy of God, which is the atoning sacrifice for your sins—Jesus Christ crucified on the cross. By His shed blood, Jesus offers us mercy. Jesus offers us forgiveness. Jesus offers us peace. Come to Him and ask Him to take control of your life. Ask Him to forgive you of your sins; ask Him to be your Savior. Ask Him to give you a new life by dying to your old life in baptism. Ask Him to fill you with the Holy Spirit so you have power to love and obey Him. If you do that, He will give you forgiveness and He will give you mercy. And you will have grace and power to show forgiveness and mercy to others. You will become a witness of Jesus Christ, who will abide in you, giving you all He is and possesses.